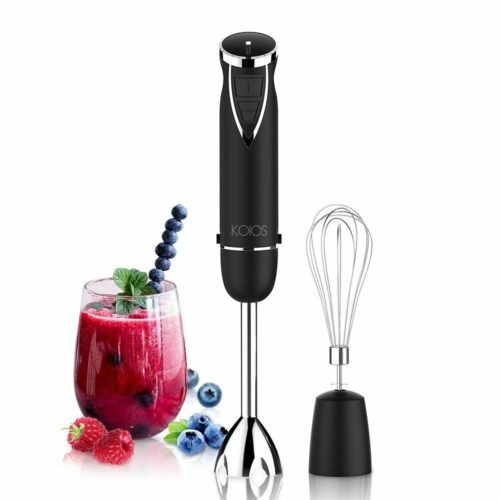 From creating deliciously fresh and healthy fruit juices, chopping vegetables for your Sunday lunch and mixing ingredients for the perfect cupcakes, this labour saving device does it all.This popular KOIOS 4 in 1 Hand Immersion Blender will become your go-to kitchen assistant. 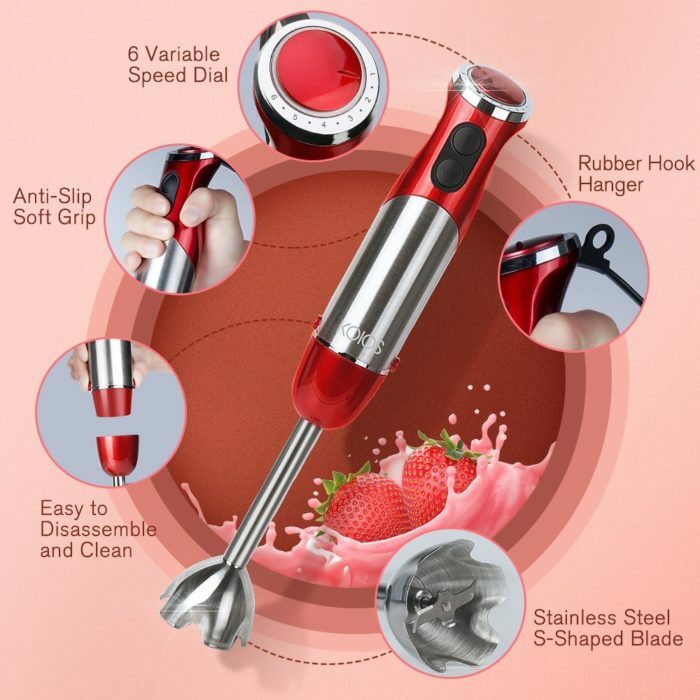 – The removable 8″ blending shaft with fixed blade locks into the motor body for easy operation.The handy “stick” design lets you blend deep in a pot, bowl, or pitcher. 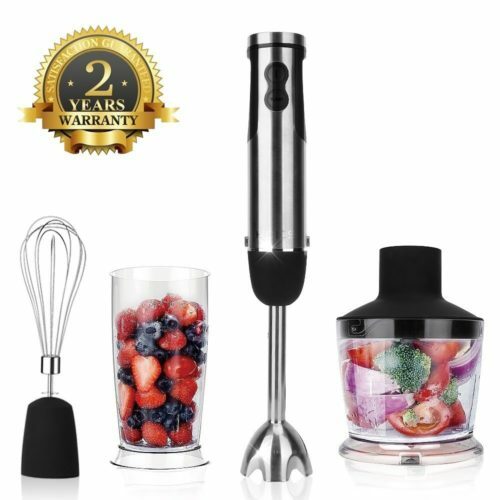 Use it to make velvety soups, thick mayonnaise, chunky pesto, smoothies, baby food and more. – Whether it’s chopping smaller items such as onions, garlic and chilli, baking ingredients such as nuts or crumbling biscuits or more complex recipes such as patés or hummus, the 500w powered S-shape reversible blade enables you to tackle everything with minimum time and effort. 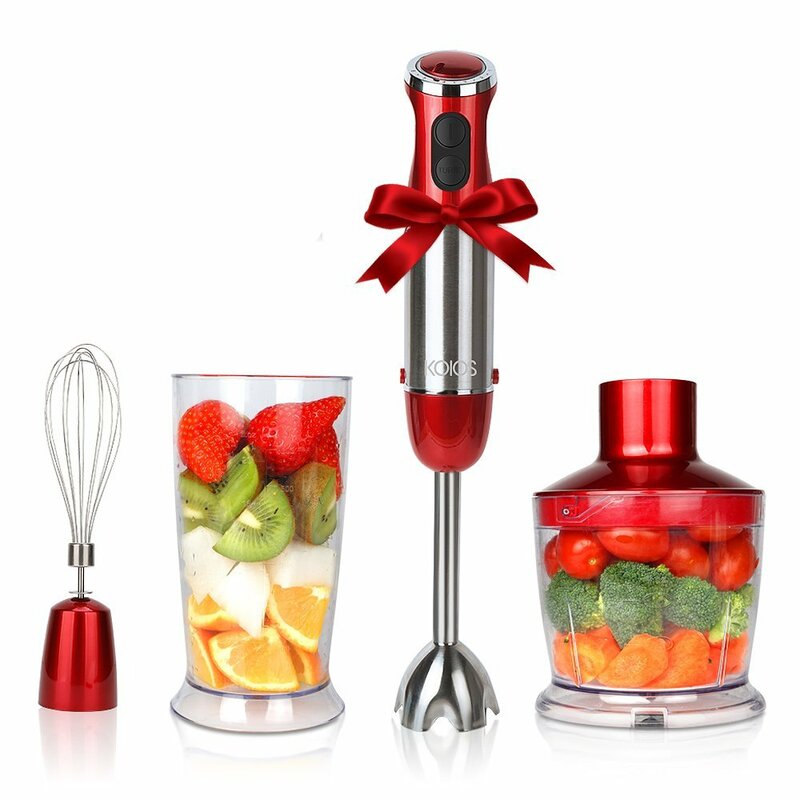 – Made of food safe stainless steel.The whisk attachment provides even faster whipping of egg whites and creams! 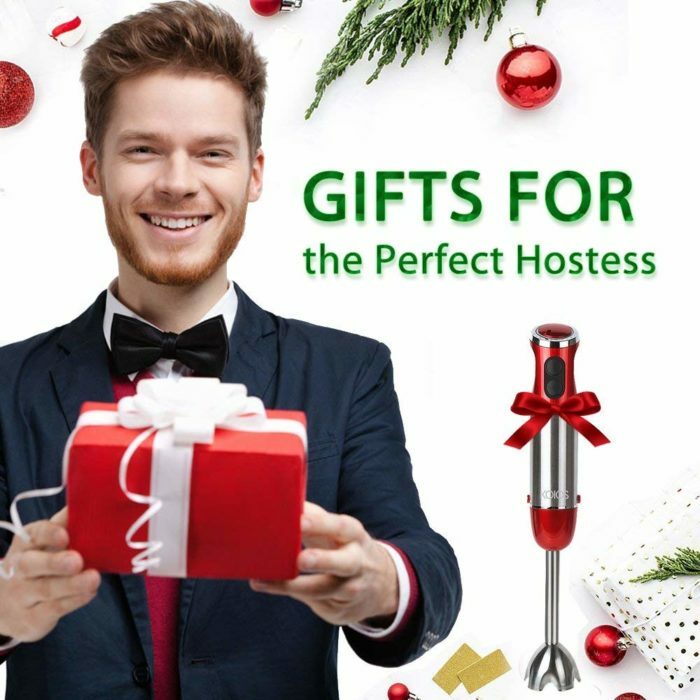 Take the hassle from baking prep with the whisk attachment. With creaming and whisking functions, this machine will make mousses, creamed mixtures, cheesecake, meringues and much more. 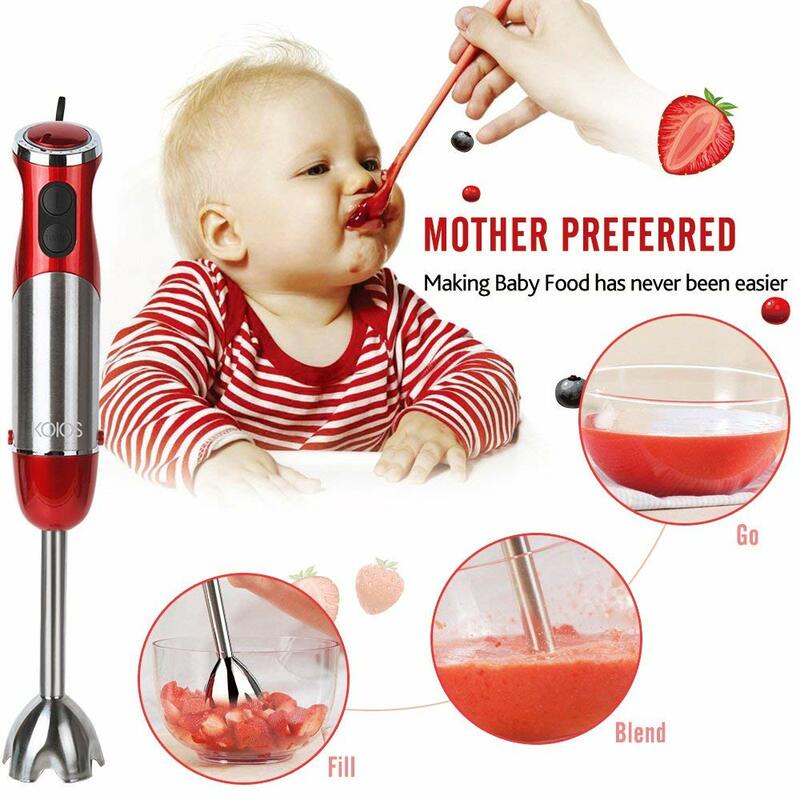 – It also comes with a 600ml mixing beaker BPA FREE for added convenience.The ergonomic and soft grip handle means this blender can be used by anyone, especially those with dexterity problems. 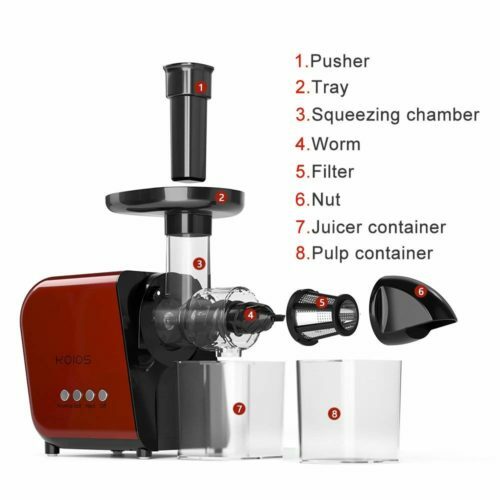 Pressing the release button at the both side on motor, the shaft will detach for easy cleaning or replace with chopper or whisk tools. 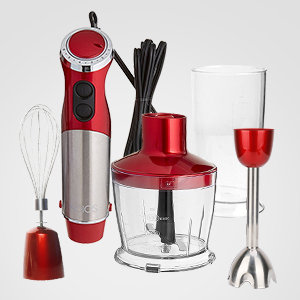 The detachable accessories – blending shaft, whisk stainless unit , S-shape blade , plastic bowl and beaker are all dishwasher safe, ensuring an easy clean-up. 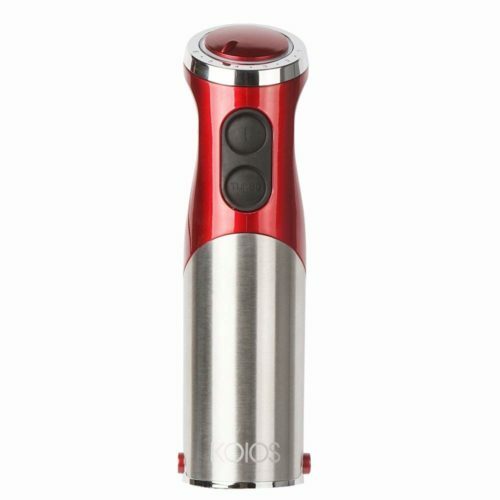 Boasts a 500W motor to power the multiple detachable accessories which allows effortless blending – you can blitz soup in just seconds! 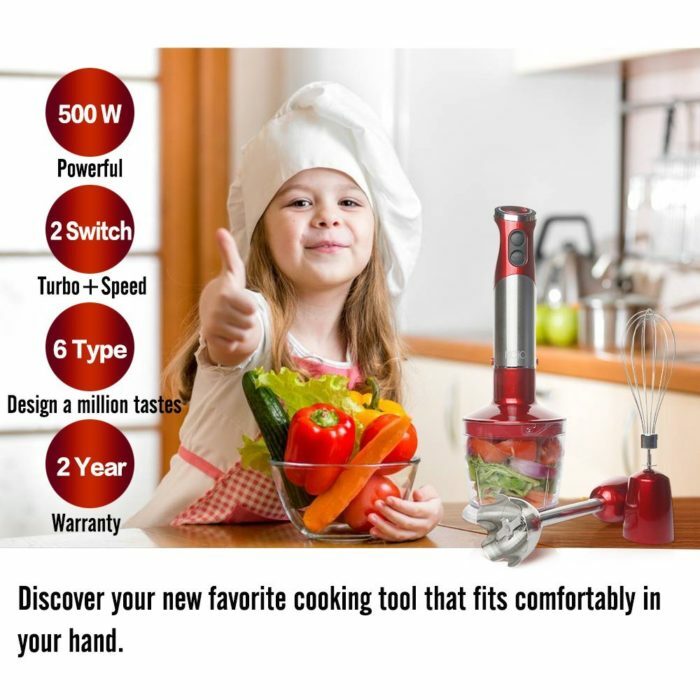 The stainless blade is partially covered by a bell shape stainless housing that keeps splashing to a minimum to keep you and your kitchen spotless. READ ALL USER INSTRUCTIONS CAREFULLY. 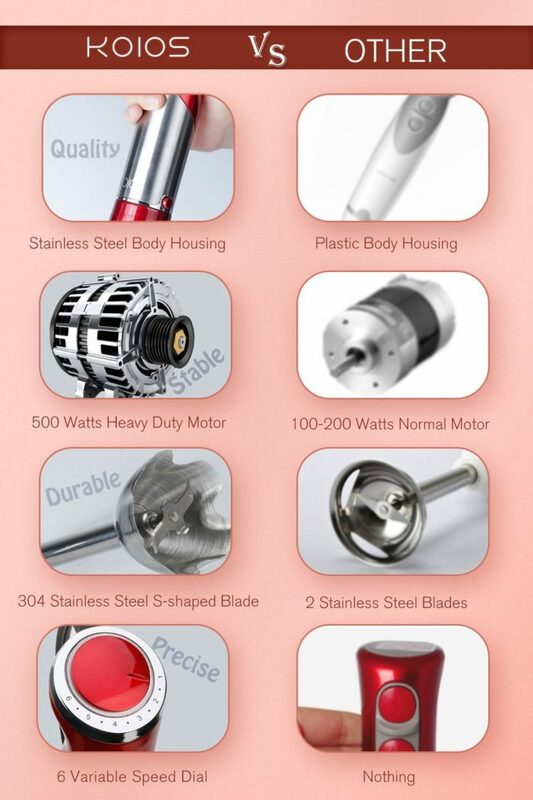 The electrical requirements volts: 110-120V. 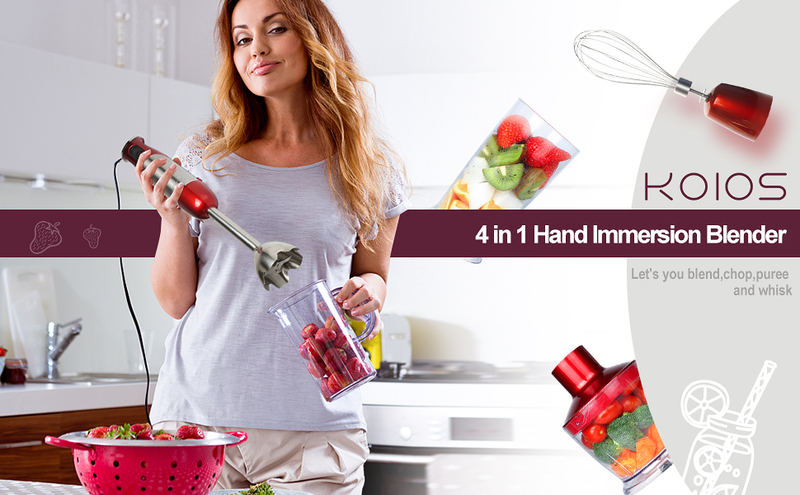 The motor/ chopping bowl lid/whisk gear are not dishwasher safe. Be sure the food is cut into small pieces before putting into the work bowl. Blades are SHARP. Handle carefully. Question: I have arthritis in my hands and in all my fingers. 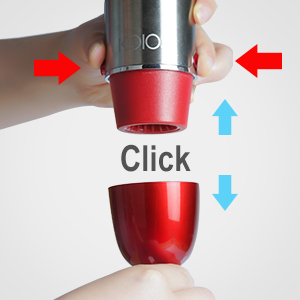 Will the button be hard for me to push, and hold in, while the blender is in use? Answer: The cord is 5 feet long. Question: Does this product have a heading element? 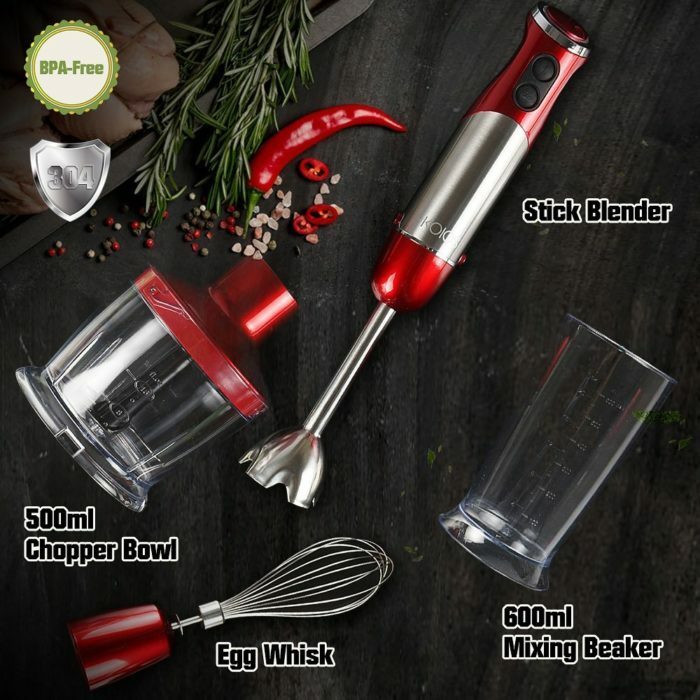 Answer: This product comes with a Wisk attachment, Chopper attachment, a Puree attachment, Liquids Resovar blender, and a Catch/Resovar bowl with Cusnart blades, into which any of he snap on attachments can be inserted and used. 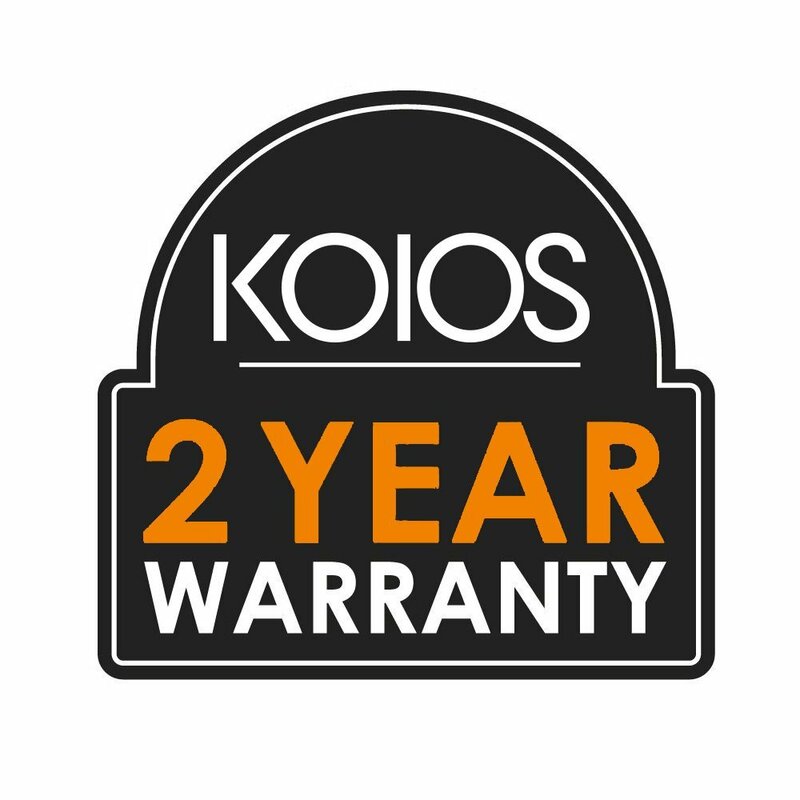 Question: Does Koios sell replacement parts for the blender stick, like a new whip or immersion blade? Answer: One of the big advantages of buying a Koios is that replacement parts are available (at Amazon) for beaker, blender, whisk, food processor, and motor unit… in other words, everything (in both red and black). 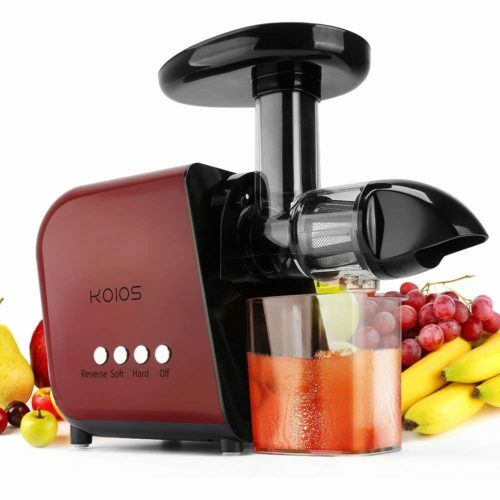 Just do a search for Koios hand blender replacement. 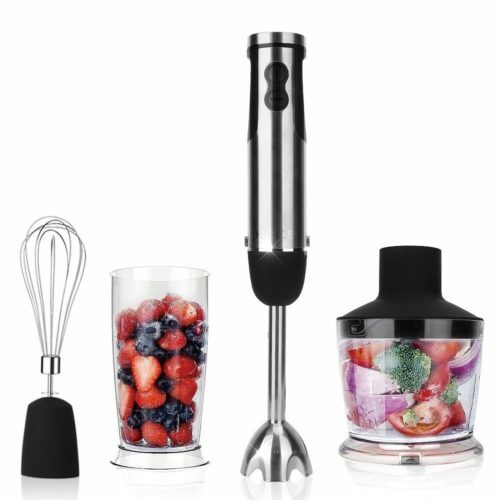 Question: What is the width of the bottom of the blender attachment at the widest point? I would like to use it to whip cream at the bottom of my coffee cup. 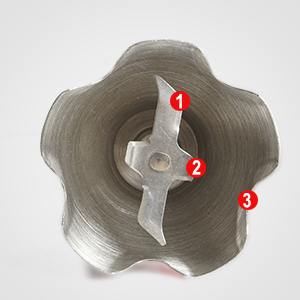 Answer: It is 2 & 1/2 inches in diameter. I measured it. Answer: This item is corded only. Question: 120 v 60 hz what is the letter next a or w? 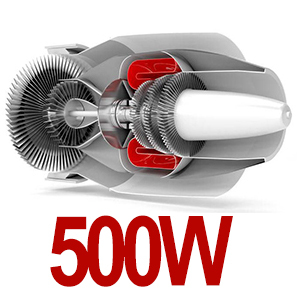 what is the power 35 or 50 w? Question: Does it have a wall hanger? Answer: No, it doesn’t. But it’s small enough to fit inside a cabinet or drawer. Question: How loud is it? I don’t want to wake the house. Question: what is capacity of the beaker? Answer: 600ml = just over 20 oz. Answer: It came in a box, with pieces in clear plastic bags inside the box. I don’t recall that it was difficult to open. Question: Has anyone used this for frothing milk for lattes? If so how well did it work? I assume use a whisk attachment ? Answer: Yeah we use it for everything including frothing milk/cream. 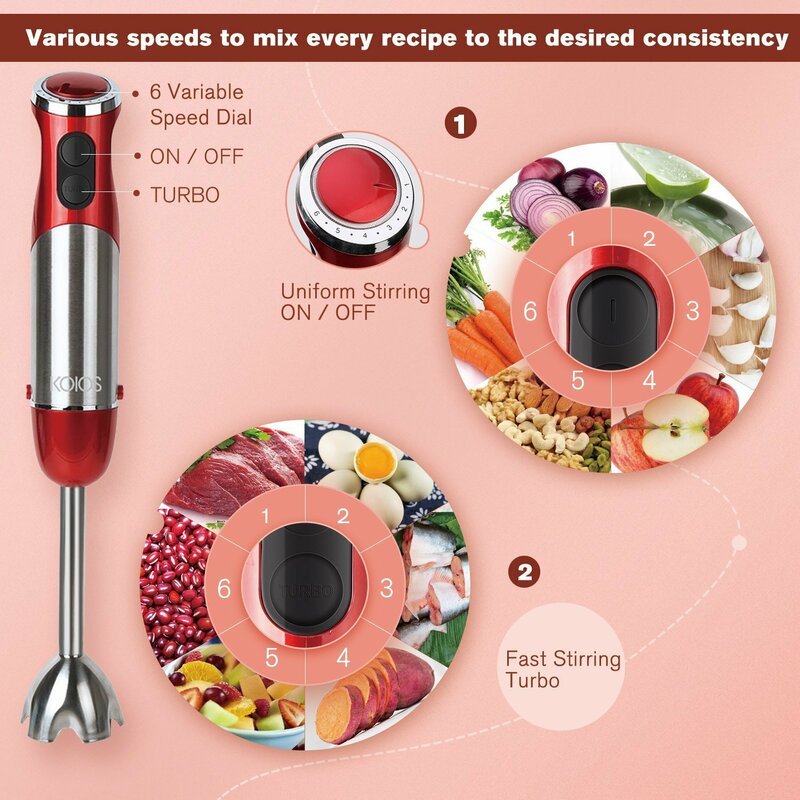 It works great for us so far as a daily kitchen tool.